Club coach James Kerr says winning the Oxon County Cup for a fourth year on the trot is one of the targets this season. 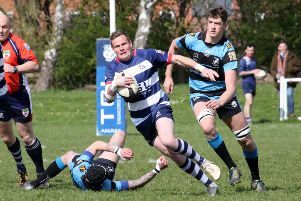 Banbury Bulls produced a great performance at beat Witney in Friday’s quarter-final. Considering the conditions, Bulls played some brilliant rugby and kept the error count very low despite the driving wind and rain. Looking back on Friday’s performance, Kerr said: “We stole quite a few and put them under pressure from the first minute. We did a great job of taking the opportunities when they came. “We played wisely in the conditions, protected the ball. I was expecting a scrappier game, a lot of knock-ons and unforced errors considering the conditions, but the boys were fantastic.